'Opal Koboi, power-crazed pixie, is plotting to exterminate mankind and become fairy queen. If she succeeds, the spirits of long-dead fairy warriors will rise from the earth, inhabit the nearest available bodies and wreak mass destruction. But what happens if those nearest bodies include crows, or deer, or badgers - or two curious little boys by the names of Myles and Beckett Fowl? 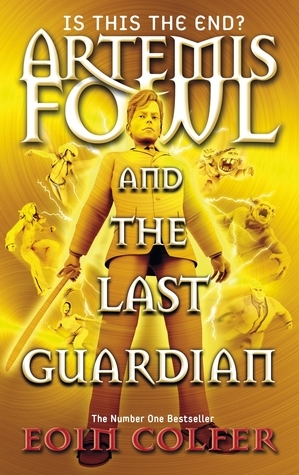 The Last Guardian is the final instalment of the Artemis Fowl Octet. In case you haven't read the earlier books, I have posted the reviews of all the previous books. As for this review, I shall try my best to not evaluate it as a 22 year old but as the 13 year old who was enthralled by The Eternity Code nine years ago. The book continues the pattern, wherein, the odd numbers in the octet can pretty much be a stand alone and has a different antagonist (Holly Short (Artemis Fowl), Jon Spiro (The Eternity Code), Leon Abbot (The Lost Colony), Turnball Root (Atlantis Complex)) and the antagonist of every even numbered book is Opal Koboi, the power hungry pixie. Opal being the core antagonist, she has come up with yet another plan, to become all powerful, end the human race and proclaim herself fairy queen and in this mission, she takes the support of the long dead fairy warriors who possess human bodies (Myles and Beckett Fowl, Juliet Butler). Similar to the other even numbered books, Artemis and his friends try and stop Opal's plan, against all odds. I would appreciate that the author has maintained the pattern and yes, the fact that he has finally decided to end it. I liked the way in which Artemis' character evolved, from being someone who wasn't much different from Opal Koboi in terms of personality where the primary aim for both was to seek ultimate power; but then, Artemis has changed, and for the better where he actually begins to show concern for others and is even willing to sacrifice himself in order to stop Opal. After all, the author has stated on numerous occasions that this is a story of a boy growing up and to that extent, I would say that he has grown up into a fairly mature young adult. For the fans of the series, the usual humour was maintained in this book as well; Holly with her sarcastic responses and Mulch with his mannerisms. However, the greatest drawback of the book is the fact that it was the eighth book. 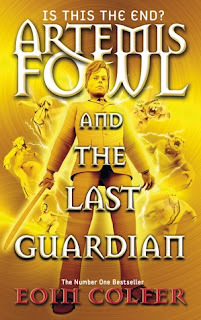 Despite being one of those original Artemis Fowl fans, considering the time he took to complete the series, I was already out of the target age. I bought this book immediately after its release in 2012 and I could never really get beyond the first few pages owing to a combination of two reasons; the beginning was poor, I was no longer interested or impressed by Artemis' extreme condescending attitude but that was the first 30 pages about and of course, beyond a point, I found it a little too childish. Barring that, I wasn't too happy about this cliche stuff of bringing out the undead, we have enough zombie novels, the author has already created a wonderful fantasy world, there was no need for him to add yet another element into that world. And last, some of the characters such as Foaly, were severely underused and to all those who expected a romantic touch to the book following his misadventure in The Atlantis Complex, they'd be disappointed, there was absolutely none and of course, the much awaited return of Minerva Paradizo never happens. I said the start was poor but it would be a little unfair on the book if I miss out on this detail, it is true that I read the first 100 pages over four years (losing interest after a few pages each time I pick it up) but then, when I started reading it this time, I managed to complete it and thus, I would say that the plot improved as the story progressed. Being the last book, I would also opine on the ending that the book did have a fitting end (note: it is no spoiler, I have just said fitting) and a long time fan of the series can close the book with a sense of satisfaction that there was a proper closure to the series. To conclude the review, I would say that this was a reasonable finale and could possibly be enjoyed more by a 15 year old fan of the series. I am glad that there are no further sequels or supplements and I hope there wouldn't be. I would rate this book a six on ten; it was a reasonable read, definitely, but certainly not as brilliant as The Eternity Code or The Opal Deception. 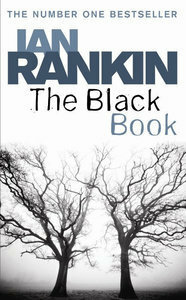 The Black Book is the 5th instalment in Ian Rankin’s Inspector Rebus series. Rebus is troubled; to start with, he gets thrown out of the house by his girlfriend. Added to that, his brother Michael, ex-con (read Knots and Crosses) returns to stay with him till he gets his things in order. His close colleague, Brian Holmes is severely attacked and is in coma and Holmes’ girlfriend hands him a black book that he used to maintain, to Rebus, contents of which she believes to be the cause of the attack. On the other hand, his superiors put him in Operation Moneybags, intended to put one of Cafferty’s (a notorious Crime Boss) financiers out of business but, Rebus is more interested in an incident that took place five years back, where a murder took place at the Central Hotel (identity of the victim yet to be identified) and there was a subsequent fire destroying the hotel. Rebus believes that Cafferty is linked in some way and also believes that the incident is also connected to the attack on his colleague. I liked it how the author initially focused more on the personal life of Rebus, considering it was totally missing in the last two novels of the series and also the fact that the book didn’t begin with a murder, rather, the investigation was on a murder Rebus’ superiors weren’t interested in. Moreover, this was the first time in the series that I found elements of a police procedural being put to use, where, Rebus was working on a case which his seniors didn’t want him to spend any time on and a series of events also leads to his eventual suspension. I liked it how Rebus’ bossy traits are beginning to be brought out, with the joining of a new DC, Siobhan Clarke, a recurring character in future novels (I have read one of them). Added to that, considering the book came out in 1993, I liked the author’s progressive attitude towards the gay community and their positive portrayal in the book (there is an Elvis-themed restaurant in the book). For someone accustomed to the series, it was good to see certain characters like Matthew Vanderhyde (from Hide and Seek) and Cafferty (from Tooth and Nail) return in this book. However, the book was very slow and there were too many characters and simultaneous investigations being carried out by Rebus and Clarke that I found it too difficult to follow beyond a point and in fact, this aspect of it didn’t allow me to enjoy Rankin’s writing and Rebus’ cynicism, which I otherwise are some of the favourite elements of mine in Rebus novels. It took till the end of the book for Rebus to connect the dots and I am unsure whether certain readers would be willing to have that much patience. I have read Rebus’ books off-sequence in the past but to those who are going to read his book for the first time, this is not a great book to start with. However, for someone who is accustomed to the series, I really enjoyed Rebus’ character develop further and I am certainly looking forward to more. This was a decent read but if I compare it with its two immediate predecessors (Tooth and Nail and Strip Jack), not so great. I would award this book a rating of six on ten.